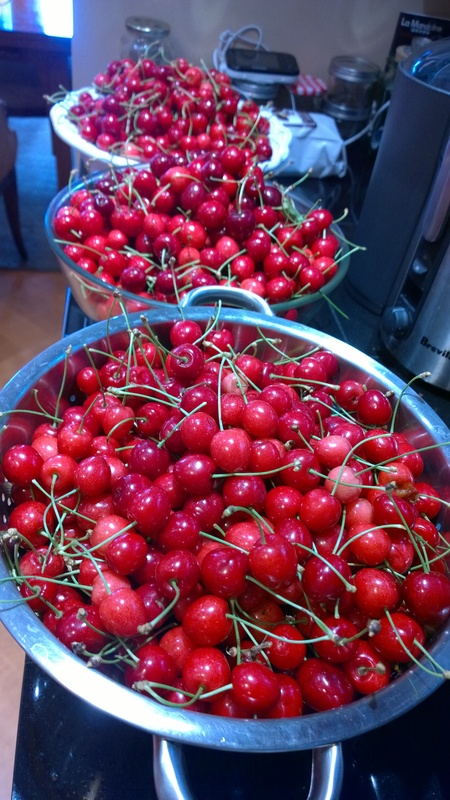 During the last part of June our cherry tree produced over 35lbs of cherries. We and I mean the royal ‘We’ the six humans (2 kids, 2 adults, 2 sitters) and the dog could not eat that many cherries. My husband said I could always make jam like his mother use to. 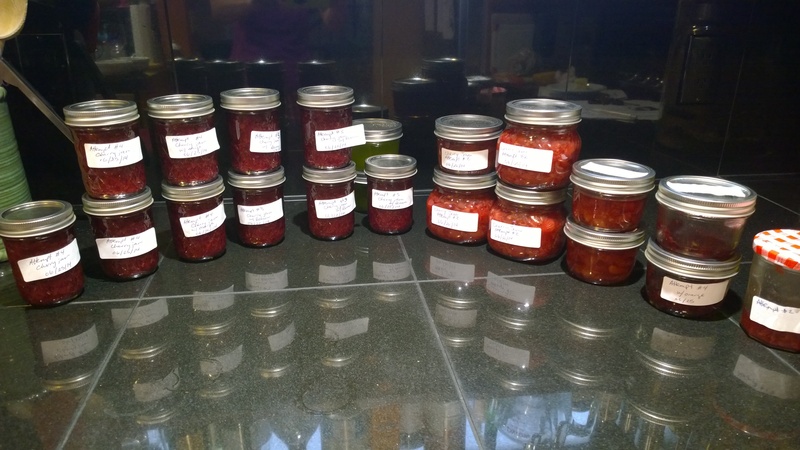 If you knew me back in the day – the idea of picking, pitting and making homemade jam would not be something that I’d do. It started while I was walking through the grocery store, I saw Mason Jars. I love Mason Jars. So I finally said why not make jam, as long as someone else picked the cherries. So after attempting to make jam three times the fourth one was the best. I wouldn’t have been able to do it without this website Food In Jars. The blogger is fantastic. She posts recipes from jams, jelly’s, preserves, butters, sauces, chutneys, relishes, soups etc. and she responds to you if you have questions – in which I had a few being a new ‘jammer’. I highly recommend you check it out especially if you’re new to jamming. In addition, she has a glossary of terms i.e. Processing – didn’t know exactly what that meant when I first looked at the Cherry Syrup Recipe. There is a certain technique to making jam/canning – see her Canning 101 it’s incredibly helpful to us novices. Don’t forget to check out her cookbooks Food in Jars: Preserving in Small Batches Year-Round My first attempt – I didn’t use the website as I was unaware of it– I used a recipe from allrecipes.com and that version of cherry jam is known as my cherry syrup (which I’ll make again – see recipe below). It’s great on pancakes or in plain yoghurt (I didn’t read the instructions correctly – I needed 3 cups of pitted and crushed cherries not 3 cups of pitted cherries). For my second attempt a friend lead me to Food In Jars and I made the Sour Cherry Jam. My mistake was I did not boil the jam long enough (when they say boil that jam they mean it). Jamming! 3 have been eaten before this photo was taken. The third attempt I experimented with the sugar level, additives such as orange and lemon rind and that jam was quite yummy for those of us who like a bit of ‘splash’ but the fourth the royal WE says it has the perfect consistency, sugar level and ‘splash’ (see variation of recipe below). Well 4 sets of jam only used 16lbs of cherries I still had 19lbs more to use. So I made 3 variations of cherry pies – 2 were eaten and the other cherry filling is in the freezer to bake at a later date (I did eat 1.5 pies), I made a cherry cake, two cherry butter brown bars, cherry popsicle and a cherry clafoutis (which I didn’t like but sitters did). My husband made 4 batches of Molly Moon’s cherry chunk ice cream, I gave 3lbs away to friends and other friends came and picked the remainder cherries from the tree. At the end of my two-week cherry extravaganza my finger nails were stained with cherry juice, my hand was cramped from pitting 35lbs and cherry juice was all over my walls. A neighbor said to me – next year why don’t you set up a cherry stand and sell cherry’s instead of lemonade. I think I’ll do that. Listed below are the recipes that I did and their variations. Cherry syrup (which I’ll make again) My variation: use 3 cups of pitted cherries. Cherry Pie My variation: I did not use the pastry recipe I used my grandmothers and added 1 1/2 tbsp of fresh lemon juice. Cherry Brown Butter Bars My variation: I added more cherries because I could and added 1/4 cup of crushed walnuts in the batter. Plum Torte / Cherry Cake Note: Last summer I used this recipe for the Italian Plumes, then frozen peaches and blueberries and now fresh Cherries. I’ll use it again for the Italian Plums when in season. My variation + a friends too: we added 1/4 cup more butter, 1/2 cup of ground almonds, 1/3 cup more of sugar, and an extra egg. In addition I poured half of the batter in, then spread the fruit over that first layer (make sure you first pat your fruit down with a paper towel to remove excess wetness) then I pour the other half of the batter in and then spread more fruit on top. I then sprinkle it with the topping of cinnamon and sugar. Cherry Chunk Ice Cream You’ll have to buy the book to get the recipe (it’s so good).